Express how you feel about the Hamlet Special Edition controversy. Following the groundbreaking discovery of a previously unknown play by Shakespeare, the Hamlet prequel The Phantom Menelaeus, WikiBard has shocked the academic community by dual announcements: First, a newly-discovered version of Hamlet that Shakespeare revised late in his life—some twenty years after originally penning his beloved classic—was just uploaded to Wikibard. Second, the site has released this text as an ebook titled Hamlet: Special Edition. Prior to this discovery, there were three known texts of Hamlet: the First Quarto (1603), the Second Quarto (1604), and the First Folio (1623), all of which differ from one another. For example, 230 lines are unique to Q2, and 70 lines unique to FF. Furthermore, prominent scholars including Harold Bloom, A. S. Cairncross, and Jack Guardant have all argued that the so-called Ur-Hamlet referred to as early as 1589 but of which no copies survive was in fact written by Shakespeare and was simply an early version of a play that the Bard revised over many years before the 1599–1602 range to which the play’s authorship has been generally ascribed. The new version features improved iambic pentameter and restores scenes that had become possible due to advances in the technology of dressing squires as women. Most controversial is a change to the famous scene where Hamlet stabs Polonius through a curtain. 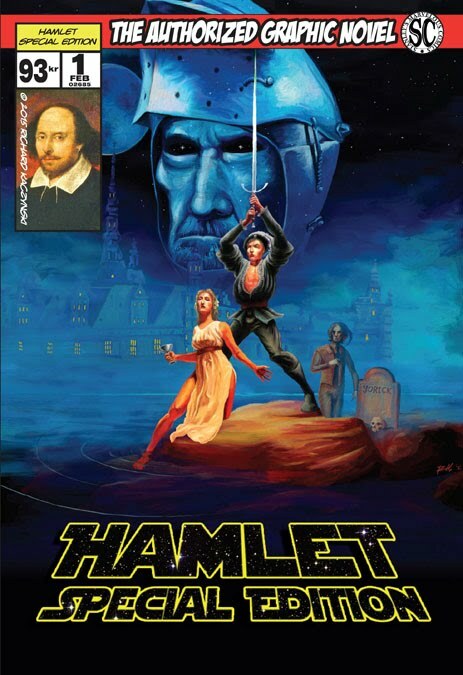 In the Special Edition, Polonius initially attempts to stab Hamlet but misses, and the Prince of Denmark kills him in retaliation. This change has enraged scholars, who have spent their entire careers studying, analyzing, and memorizing the original. An especially vocal group of professorial protestors have had t-shirts printed with the motto “Ham Stabbeth First.” They swear that they will keep their original editions of Hamlet and never read the new one again. 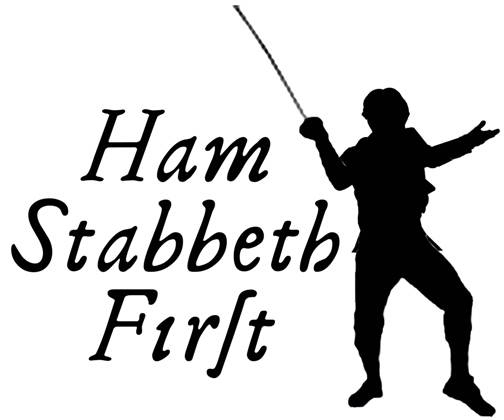 The "Ham Stabbeth First" logo, pictured above, has been adopted by those who oppose the changes in Shakespeare's final revision to Hamlet. Copyright © 2015 Richard Kaczynski.